While fatty meats can cause your cat indigestion, which can trigger your cat to vomit her meal, meats which are too lean present other problems. Animal fat is full of good stuff, including to the cat essentail fatty acids like Linoleic Acid, Linolenic Acid, Arachidonic Acid. Animal fats also carry considerable caloric density, increase palatability, and satisfy. It is therefore necessary to add animal fat back to meat when meat is extra lean, as is the case with skinless turkey breast, skinless chicken breast, and most game meat. 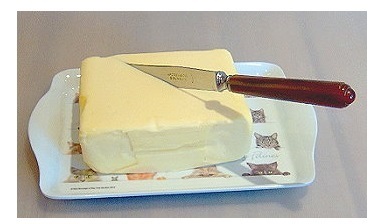 The best way to add beneficial fat to the cat’s diet is with butter. Butter is a pure, minimally processed food providing the essential fatty acids, but also Vitamin A and D. To mimic the natural 6% fat content of a mouse in your homemade cat food, add about 50-60g butter to 900g meat, if the meat is considered to be too lean. Allow the butter to soften at room temperature and work it into ground meat before proceeding with the preparation of the cat food. When using meat chunks, it may be necessary to melt the butter over low heat and mix it into the premix and water before adding the meat chunks. Veterinarian). A lack of animal fat in your cat’s diet can also negatively affect the health of her liver and kidneys. Dietary animal fat is essential for the overall health of all cats and normal development of kittens.